This iExpression is applied to the time remapping property of the layer and allows to play back some region of the clip at each marker. This is useful, for example, if you have a precomp with w twinkling eye and want it to twinke at each marker. You can also apply the iExpression to audio layers in order to play the audio at each layer. However, in the audio playback, you might hear some rewind noise when teh time remapping jumps from the end to the beginning. To avoid this, apply the same iExpression to both the time remapping and audio levels. When applied to the audio levels, the iExpression will mute the audio whenever it "rewinds". where the range starts that should be played at each marker. where the range ends that should be played at each marker. allows to shift the playback: for -2, the time remapping already starts 2 frames before each marker. is the name or index of the layer whose marksers should be considered (if "Use Markers from" is set to "other layer"). 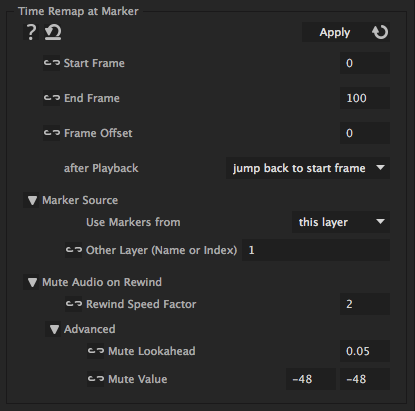 When you do time remapping on audio layers, you get a short "rewind noise" on the jump from the end to the beginning of the audio. To avoid this, apply this iExpression to both the Time Remap and the Audio Levels property. Then the iExpression will mute the audio whenever it rewinds. The Rewind Speed Factor determines when the audio is muted. For 5, it mutes whenever the audio plays faster than 5x normal speed. How far before and after the rewind the audio is already muted. Only change here something when the rewind noise does not disappear completely with the default settings.